Panayiotis Georgiades, the box-owner of CrossFit Limassol, is giving us a little insight into what happens at his BOX! Enjoy another episode of our Europewide BOX interviews. As a trainer I am always looking for new ways to improve my knowledge. Investigating the world of fitness and searching online about high intensity functional movements CrossFit appeared as one of the links. I found it very interesting and adapt it to my lifestyle and wanted to start learning as I wanted to pass it over to other people! I opened my own box as I always invest in what I love doing in my life .CrossFit is something which suits my lifestyle and incorporates high intensity functional movements which I was always introducing in my workouts. In Cyprus there was also the opportunity to introduce this new way of fitness and therefore CrossFit Limassol is the first CrossFit affiliate box in Cyprus. As the first affiliate Box in Cyprus with the first certified trainers from the CrossFit Cyprus Directory list we have more experience in the way we teach. Our friendly environment and team of trainers help towards building a strong community. Also the combination of our unique industrial interior, facilities and central location in Limassol is appealing to potential customers. We have approximately 120 active members 40% women. Age range from 15-65 with 12-15 competitive athletes. We have Gymnastics, Olympic lifts and Strongman classes. Some tips and advices but not a nutritional plan. We suggest our members to visit a professional nutritionist to get consultation. All new members have to join the Rookies class. These classes consists mobility drills and simple exercises to warm up. At each class we introduce 2-3 of the fundamental movements with great emphasis on the technique followed by a small easy wod from what they learnt from the fundamental skills. The cool down includes stretching and discussion with the coach as well as some questions or clarifications can be answered after the end of the class. 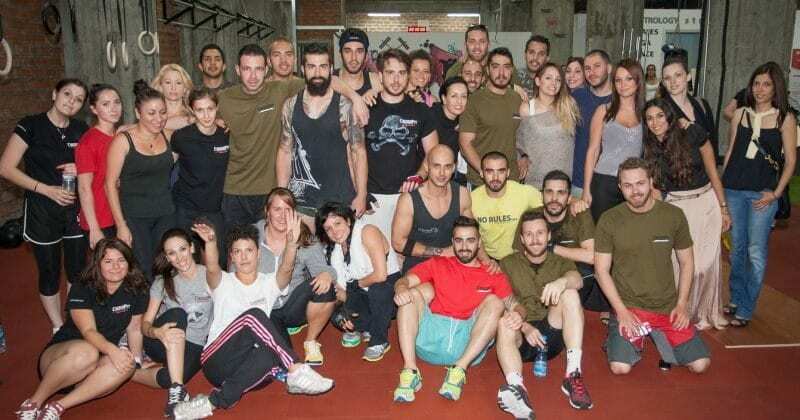 CrossFit Limassol organized the Cyprus CrossFit competition (once per year an open competition), 4 Bootcamps , and every 2 months an internal competition between members. We do have a communication but we did not yet linked other boxes as they need o built their community first .Until summer when the next Cyprus CrossFit competition will happen we definitely going to have links with all Crossfit affiliate boxes in Cyprus. Yes the person coming to join even for one time the trainer has to know if he/she is a beginner or have any health problems and drop in a CrossFit or Beginners class. They need to ask or contact the director of the Box. First time contact via phone number 0035725340271 or email at info@crossfitlimassol.com or through Facebook page. If he/she wants to register for a month he/she has to book at www.crossfitlimassol.com.